This is the door which was visible when I first showed you the Church Of The Holy Trinity on Tuesday. 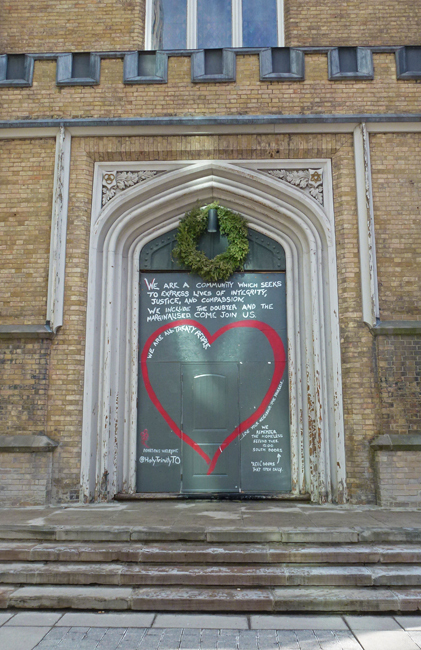 This door is not used but rather one enters the church from the side although the large heart works to welcome all into the congregation. It is a lovely doorway but could use some TLC. * Since I wrote this post I have found out that the doors here were set on fire last summer and new replacements are near completion and this will again be the grand entrance to the church. You can actually see a bit of charring on the threshold of the doorway. Sad that someone would set fire to a church door. Who would set church doors on fire? Stuff like that makes no sense to me and I worry about all the crazies in our midst. I saw that heart in your previous photo. The door could use a little work, but the congregation probably has more important things to worry about at the moment. I was about to type the same opening line that Lowell said above. Who on earth?? I like the heart that is painted on this door. It seems to separate the good people who help from the bad people who set fires. I remember that in the news. Sad to hear about the fire. Why some people do things is beyond me. Very sad about the fire, but I imagine it could have been far worse. It was spared! Set on fire? Some idiot took a match to it? Lowlifes!